Two days ago at a Presentation Ceremony that was held in Melbourne for the 2018 BHP Billiton Foundation Science and Engineering Awards, STANSW Young Scientists won the top three awards, the first state to ever achieve this feat. Minh Nga Nguyen (middle left) from Sydney Girls High School won the Investigations category while fellow Sydney Girls student Angelina Aurora (middle right) won the coveted Innovations to Market Award. Oliver Nicholls (right) from Barker College won the Engineering category and Lachlan Bolton (left) from Redeemer Baptist School won second place in Engineering. 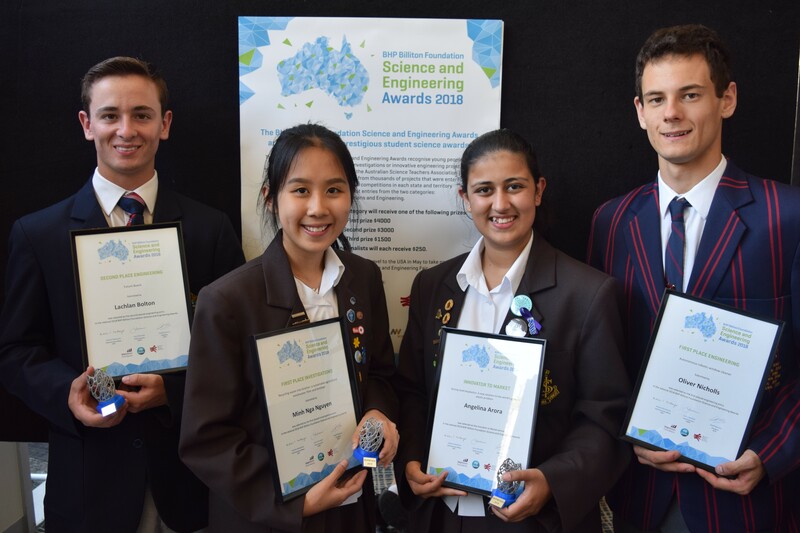 As well as winning more that $10,000 in prizemoney between them they each will be representing Australia in May at the Intel International Science and Engineering Fair to be held in Pittsburgh. Angelina will be travelling with the BHPBFSEA team and Lachlan, Nga and Oliver will be travelling with the STANSW Young Scientist team. Details and videos of their projects and the other national finalists’ projects can be found on the BHPBFSEA website. Primary school and semi-finalist results are yet to be released.